Cook it, eat it, share it and always hungry for more. I can't begin to tell you how much I love this sour fish soup- It's so incredibly delicious. 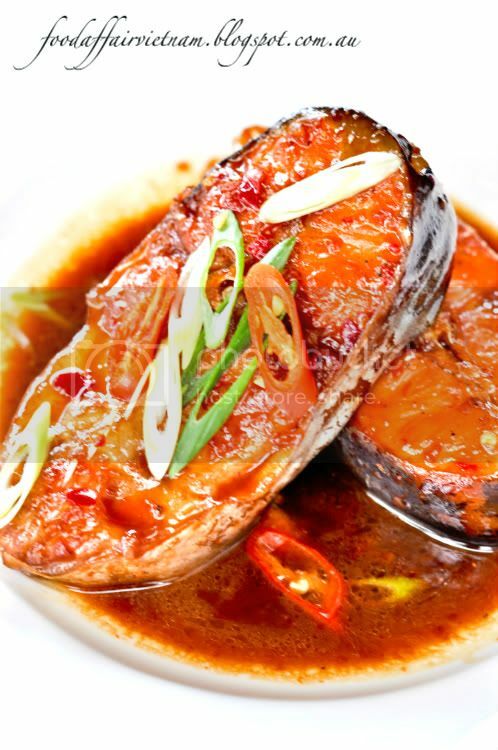 Beautifully moist and tender fish cooked on the bone, in a tamarind stock. Along with a selection of the freshest vegetables, including okra- which is my favourite, tomatoes, pineapples and uniquely to this soup 'bac ha' (stems of a taro plant, often referred as elephant stem). The porous structure of the stem is perfect to absorb up all that beautiful tamarind fish broth. 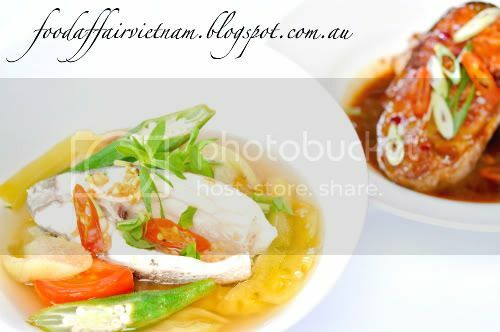 This is commonly serve along with Ca kho (caramelised braised fish). 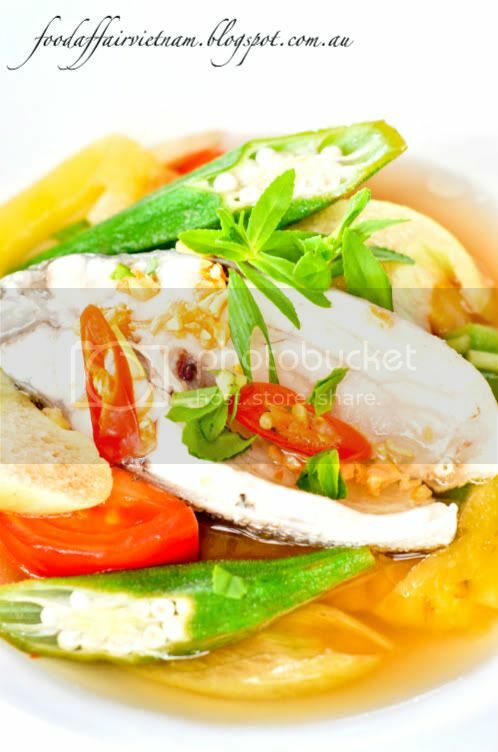 It's a phenomenal combination, the sweet and sour from the fish soup. Coupled with the sweet and salty from the braised fish is so ridiculously good with steaming hot rice. This soup is remarkably simple to whip up, I frequently cook this when I'm pressed for time but still want something that is comforting, satisfying and always a joy to eat. For this recipe, any white flesh fish like baramundi, silver perch or snapper will do. To add extra depth of flavour to the soup, I like to use the whole fish, from head to tail, bones and all. The unique sour taste comes from tamarind. 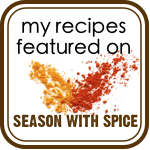 It usually comes in the form of square blocks, but if you can't get hold of the tamarind pulp, tamarind seasoning powder is a great alternative. 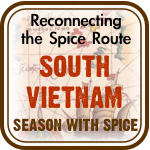 Like many classic Vietnamese dishes, it has an incredible depth of flavour and texture. A taste of this and like me, you'll will be having this on the dinner table on a regular basis. 1. Dissolve the tamarind pulp in 250ml hot water. Work the pulp until dissolved and then strain the liquid through a fine sieve, discarding the pulp. 2. Combine the 1 litre water, tamarind liquid, pineapple and sugar in a large saucepan and bring to the boil. 3. Meanwhile, add 2 tbsp of oil in the pan bring up the heat to fry the garlic until just coloured. Then turn off heat and transfer to small bowl. 4. Then add the fish, tomatoes and boil for 3minutes or until fish is cooked. 5. Season with fish sauce and sugar. Adjust the balance of sweetness and saltiness according to your preference. 6. Add the elephant stem, okra, bean sprouts and bring to the boil again. 7. Transfer to large serving bowl and garnish with fried garlic mince, rice paddy herbs and sawtooth coriander. Enjoy with a dipping sauce of freshly sliced chilli and fish sauce. I have never had an opportunity to try a tamarind, only in a form of juice, I guess the soup must be delicious! The picture is just great! It absolutely delicious I promise you! 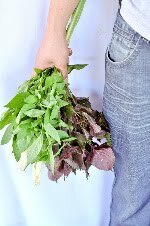 Thank you for a great blog, I like reading about food in SE-asia. Thanks for share the amazing descriptive article about restaurant in Charleston and recipes they serve. Find your local King street restaurant for Vietnamese recipes where you can have Banh Mi, Pho, cocktail, noodles in your launch or dinner. Lemon cured beef salad (Goi bo tai chanh). Tantalise your taste buds with this mouth-water beef salad.